Mineral-rich grains like wheat, spelt & quinoa. Just a touch of honey. 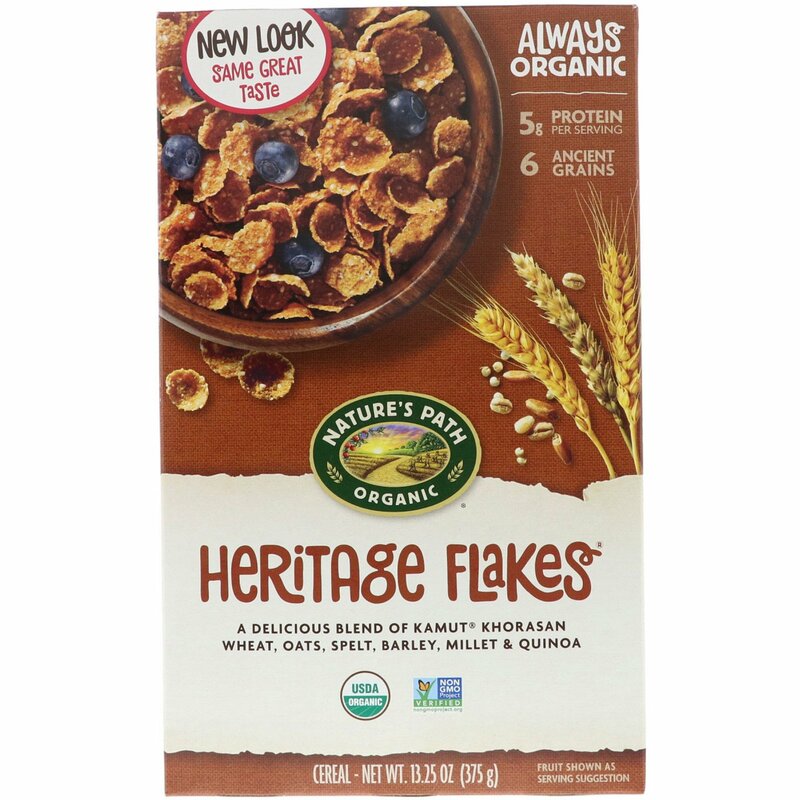 To create our Heritage Flakes cereal we baked together organic ancient grains like Kamut khorasan wheat, oats, spelt, and quinoa with honey for a super crunchy, fiber-rich breakfast you can't help but love. 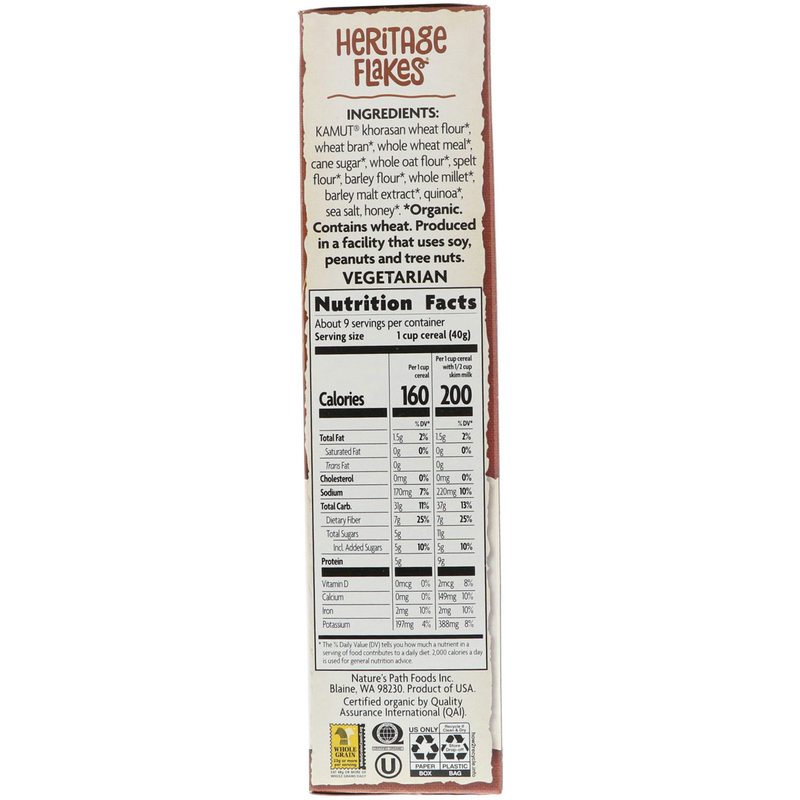 And with such simple, wholesome ingredients - you'll see how good organic food can be. "Our Always Organic Promise goes back to the family farm I was raised on - well before the organic 'industry' began. In 1985, my wife Ratana and I founded Nature's Path Organic Foods based on my dad's advice to 'Always leave the soil better than you found it,' by farming without chemical pesticides, fertilizers or GMOs. For over 30 years, our family has aspired to make delicious organic foods and an enduring independent company that you can love and trust." Kamut khorasan wheat flour*, wheat bran*, whole wheat meal*, cane sugar*, whole oat flour*, spelt flour*, barley flour*, whole millet*, barley malt extract*, quinoa*, sea salt, honey*. Produced in a facility that uses soy, peanuts and tree nuts. This product is sold by weight, not by volume. You can be assured of proper weight even through some settling of contents normally occurs during shipment and handling. To maintain freshness, store in a cool, dry place.